Just a heads up that next Wednesday, February 14 at 4 Pacific/7 Eastern/12 AM UTC, it won't just be love in the air but also the ISTE Standards! Join Standards guru Kristin Harrington for the webinar "Cultivating Creative Communicators: ISTE Standards in Action." This webinar will provide examples of creative classroom presentation ideas that will engage students and help them become creative communicators. Learn about strategies and formats that will help you maximize class time, engage your entire class and provide students with an authentic purpose and audience for their projects and presentations. Register here to attend live or catch the recording! 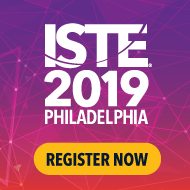 Just a quick reminder to register for the webinar "Cultivating Creative Communicators: ISTE Standards in Action" on Wednesday, February 14 at 4 Pacific/7 Eastern/12 AM UTC. Register here to attend live or catch the recording!